Available this summer, the new BeamPro 2 promises more realistic telepresence visits with colleagues, customers, patients and others. For those of us intrigued by telepresence technology, the new BeamPro 2 might be what Santa should have left under our trees — except, well, that it wouldn’t have fit. But on other scales, the release of this new and improved device promises more realistic visits with colleagues, customers, patients, and others with respect to video, audio and maneuverability. Available this summer, the BeamPro 2 provides better face-to-face interactions with its enlarged multi-touch display and vertical screen height adjustment. It has been engineered to move more easily around crowded spaces with its wide-angle cameras and additional sensors for detecting obstacles. It also provides improved audio and video. What are the big changes in BeamPro 2? The original Beam products were designed primarily to be super reliable in providing robotic telepresence. 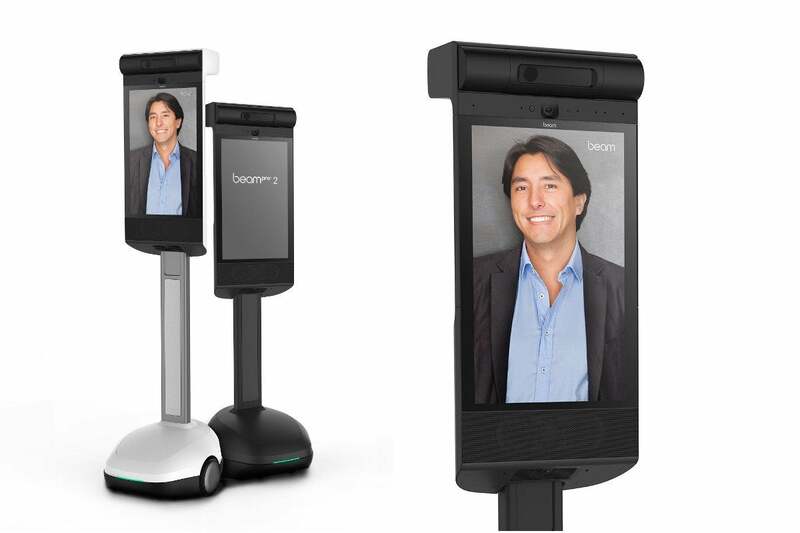 The new BeamPro 2 device is designed to be a modular mobile platform that can provide telepresence as well as other technologies to the user. For example, depth cameras have been added for 3D viewing and safety, along with the option to add LIDAR or PTZ cameras, or PT Laser pointers, or many other sensors to the device. The goal is to be able to add accessories and have the connections, power and platform to do so — exploring areas outside normal telepresence. Note that the BeamPro 2 accessories will be provided by Suitable Technologies and possibly third parties. End users will not be able to add accessories on their own. The BeamPro 2's more natural and flexible controls will allow more comfortable and, therefore, more productive meetings. Its patented low-latency (fast transmission) algorithm helps ensure the sense that the individuals interacting with each other on both ends of the connection have a sense that they are truly speaking face to face. Telepresence technologies allow increasingly natural interactions with people at remote sites with significant cost and time savings over sending your staff around the country or the globe to meet in person. While I haven't had an opportunity to test-drive the new model, I'm already daydreaming about manuevering one into a board meeting or political rally. Maybe invitations to test-drive one will probably be showing up on the Suitable Technologies site before too long.